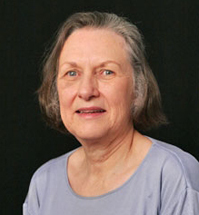 S. Kay Obendorf Ph.D. (physical chemistry from Cornell University, 1976) is a Professor of Fiber Science in the College of Human Ecology at Cornell University. Her research and teaching interests are in the area of fiber science, chemistry of fibers and films, and protective clothing. She was the department chair for the Department of Textiles and Apparel (now Fiber Science & Apparel Design) from 1985-95 and Senior Associate Dean for the College of Human Ecology (1997-2015). In 2010, she received the Olney Medal for achievement in textile chemistry from the American Associate of Textile Chemists and Colorists, and in 2013 she was elected as an Honorary Member of The Fiber Society. In the field of fiber science, analytical electron microscopy and spectroscopy are used to evaluate the surface chemistry of fibers and films as related to the performance of these materials. Specific research projects are selected to address issues of health and safety, preservation of the environment, and basic science and technology of polymers and fibers. Research seeks to limit the dermal and biological exposure of agricultural, horticultural, and lawn care workers to pesticides, military and chemical personnel to toxic materials, and medical care personnel and first responders/receivers through protective clothing. Novel membranes with engineered pore structures and self decontaminating functionality are developed for use in protective clothing using microporous polymer membranes, metal oxide nanoparticles, metal organic frameworks (MOF), polyoxometalates, and electrospun fibrous membranes. Han Y and SK Obendorf, Reactivity and reusability of immobilized zinc oxide nanoparticles in fibers on methyl parathion decontamination. Textile Research Journal. (2015); DOI: 10.1177/0123456789123456. Lange LE, Obendorf SK, Degradation Studies of Methyl Parathion when in CuBTC Metal Organic Framework, Journal of Environmental Chemical Engineering, 3:541–547(2015). Ahn C, Zeng X, Obendorf SK, HPLC-DAD-MS Analysis of major natural dyes with the application of H2O2/UV treatment as a way to simulate burial degradation of textiles, Textile Research Journal, 85:238-250 (2015) DOI: 10.1177/0040517514545258. Chan MA and S. Kay Obendorf SK. Surface Modification of Microporous Polypropylene Membrane by UV-initiated Grafting with Poly(Ethylene Glycol) Diacrylate Fibers and Polymers, 15: 2032-2039 (2014). Woo, DJ and Obendorf SK, MgO-embedded fibre-based substrate as an effective sorbent for toxic organophosphates, RSC Adv., 4 (30): 15727 – 15735 (2014). Lange LE, Ochanda FO, Obendorf SK, and Hinestroza JP, Development of Polyacrylonitrile-metal organic framework (MOF) composite fibers designed to remove chemical warfare agent simulants from a solution, Fibers and Polymers, 15(2): 200-207 (2014). Dixit V, Cho BK, Obendorf, SK and Tewari J, Identification of household spores using mid infrared spectroscopy, Spectrochimica Acta Part A: Molecular and Biomolecular Spectroscopy, 123: 490–496 (2014). Obendorf SK and Spero EF, Destructive Adsorption for Enhanced Chemical Protection, ASTM Performance of Protective Clothing and Equipment: 9th Volume, Emerging Issues and Technologies, Ed. A M Shepherd, ASTM International, West Conshohocken, PA, ASTM STP 1544: 435-449 (2012). Woo DJ, Hansen N, Joo YL, and Obendorf SK, Photocatalytic Self-Detoxification by Coaxially Electrospun Nanofiber Containing TiO2 Nanoparticles, Textile Research Journal 82(18):1920-1927 (2012). Obendorf, S. K. "Improving the functionality of clothing through novel pesticide protection/Novel pesticide protective clothing", Functional textiles for improved performance, protection and health, Part 2: Functional textiles for improved medical and health purposes, eds. Ning Pan and Gang Sun, Woodhead Publishing, Ltd, Cambridge, UK (2011) pp. 434-461. Obendorf, S.K., Improving Personal Protection through Novel Materials, Olney Medal Address, AATCC Review, Vol. 10, No. 4: 44-50 (2010).Y Han and SK Obendorf, Reactivity and reusability of immobilized zinc oxide nanoparticles in fibers on methyl parathion decontamination. Textile Research Journal. (2015); DOI: 10.1177/0123456789123456.